​Contact Me if interested in setting up a single coaching (single student or chamber music group), or regular, weekly lessons. 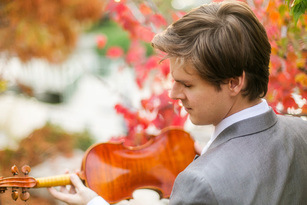 ​I teach full-time at my private violin studio in San Antonio, TX. I haven't met a parent yet who has has introduced me to their 8 year old child and said: "I want my child to become a professional violinist!" However, most parents seem interested in prioritizing the violin, making significant progress so that students can feel successful in group playing environments, and eventually see the violin as a lifelong pursuit and creative ownership activity. Most students seem interested in developing a sense of mastery, playing a variety of solo pieces, and receiving positive attention from their parents. Some students do have professional aspirations, and for those students, I have a great track record with audition preparation and matching students with appropriate collegiate programs. In my approach, I try to be flexible and take into consideration the outlook of each family that I meet. Students who make significant progress tend to prioritize and schedule at least 30-60 minutes per day of at-home practice. I organize between 4-6 optional recital opportunities each year for students. More info on private lessons here. Videos of the CASA "Youth Chamber Orchestra" that I direct alongside cellist, Diego Rodriguez. I've self-published a beginning workbook called "Violin Songs and Hand Shapes," as well as "Viola Songs and Hand Shapes." My intention in compiling the pieces in this volume is to offer an alternative repertoire set that can be used as a flexible model for the artist teaching of beginning students and transfer students, starting around 6-8 years of age and up. - Legato, singing tone through the learning of short songs. The songs have historical or cultural significance. - A straightforward, open structure, that allows for the adding or removing of works studied. - Left hand organization, as viewed through tetrachord hand shapes. - Early development of comprehensive reading skills and fingerboard knowledge in the 1st position. - Expressive bow work with the deliberate naming of bow strokes. I frequently use this volume in private instruction and find it to be an invaluable tool for building a strong foundation of violin skills and practice techniques. If you're interested in learning more about this volume, or participating in teaching training classes, please contact me. and post occasionally to Teaching Blog: ZerweckViolin.com.